Originally developed as a solution for IT experts, R-Studio is a comprehensive solution for data recovery on Windows systems with support for FAT16/FAT32, NTFS, NTFS5, Mac partitions (HFS/HFS ) and Linux partitions (ext2/ext3/et4). It can perform recovery on both local drives and network drives, even if the partitions are damaged, formatted or deleted. 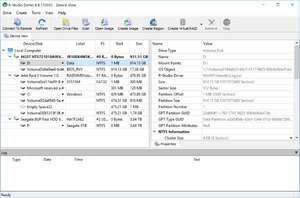 R-Studio offers users some neat features like recovering data and files lost due to a virus, lost data due to a power outage and attempt to recover files from previously existing partitions. One lovely feature of this paid software solution is, unlike various other rivals, they keep it updated constantly ironing out any known bugs and adding useful features. R-Studio 8.9.173593 is a shareware program and can be used as a demo to try the software until the free trial period has ended. A full version of the program is available after the trial period ends. For security reasons, you should also check out the R-Studio download at LO4D.com which includes virus and malware tests. Additional screenshots of this application download may be available, too. R-Studio Data Recovery Software has a presence on social networks.